The terms aerobic respiration, anaerobic respiration and fermentation do not refer to primary nutritional groups, but simply reflect the different use of possible electron acceptors in particular organisms, such as O2 in aerobic respiration, or NO3−, SO42− or fumarate in anaerobic respiration, or various metabolic intermediates in fermentation. Because all ATP-generating steps in fermentation involve modifications of metabolic intermediates instead of the use of an electron transport chain fermentation is often referred to as substrate-level phosphorylation. Simplified flowchart for determining if an organism is an autotroph, heterotroph or a subtype. Phototrophs: Light is absorbed in photo receptors and transformed into chemical energy. Chemotrophs: Bond energy is released from a chemical compound. The freed energy is stored as potential energy in ATP, carbohydrates, lipids or proteins. Eventually, the energy is used for life processes as moving, growth and reproduction. Some bacteria can alternate phototrophy and chemotrophy, depending on availability of light. Organotrophs: Organic compounds are used as electron donor. Lithotrophs: Inorganic compounds are used as electron donor. The electrons from reducing equivalents (electron donors) are needed by both phototrophs and chemotrophs, to keep running reduction-oxidation reactions that transfer energy in the anabolic processes of ATP synthesis (in heterotrophs) or biosynthesis (in autotrophs). The electron donors are taken up from the environment. Organotrophic organisms are often also heterotrophic, using organic compounds as sources of electrons and carbon at the same time. Similarly, lithotrophic organisms are often also autotrophic, using inorganic sources of electrons and CO2 as inorganic carbon source. Some lithotrophic bacteria can utilize diverse sources of electrons, depending on availability of possible donors. It should be noted that the organic or inorganic substances (e.g., oxygen) used as electron acceptors needed in the catabolic processes of aerobic or anaerobic respiration and fermentation are not taken into account here. For example, plants use water as electron donor to biosynthesis, being lithotrophs. Animals use organic compounds as eletron donors to synthesize ATP, being organotrophs (plants also do it, but this is not taken into account). Both use oxygen in respiration as electron acceptor, but this character is not used to define them as lithotrophs. Heterotrophs: Organic compounds are metabolized to get carbon for growth and development. Autotrophs: Carbon dioxide (CO2) is used as source of carbon. A chemoorganoheterotrophic organism is one that requires organic substrates to get its carbon for growth and development, and that produces its energy from oxido-reduction of an organic compound. This group of organisms may be further subdivided according to what kind of organic substrate and compound they use. 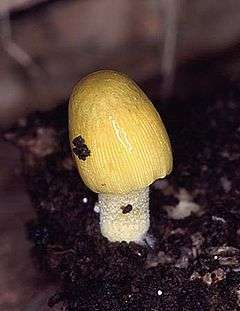 Decomposers are examples of Chemoorganoheterotrophs which obtain carbon and electron reactions from dead organic matter. Herbivores and carnivores are examples of organisms that obtain carbon and electron reactions from living organic matter. Chemoorganotrophs are organisms which oxidize the chemical bonds in organic compounds as their energy source. Chemoorganotrophs also attain the carbon molecules that they need for cellular function from these organic compounds. The organic compounds that they oxidize include sugars (i.e. glucose), fats and proteins. All animals are chemoheterotrophs (meaning they oxidize chemical compounds as a source of energy and carbon), as are fungi, protozoa, and some bacteria. The important differentiation amongst this group is that chemoorganotrophs oxidize only organic compounds while chemolithotrophs instead use inorganic compounds as a source of energy. -autotroph Photolithoautotroph Some bacteria (blue green algae), some eukaryotes (eukaryotic algae, land plants). Photosynthesis. -autotroph Chemoorganoautotroph Some archaea (anaerobic methanotrophic archaea). Chemosynthesis. -autotroph Chemolithoautotroph Some bacteria (Nitrobacter, Methanobacteria). Chemosynthesis. Some authors use -hydro- when the source is water. All sorts of combinations may exist in nature. For example, most cyanobacteria are photoautotrophic, since they use light as an energy source, water as electron donor, and CO2 as a carbon source. Fungi are chemoorganotrophic since they use organic carbon as both an electron donor and carbon source. Eukaryotes are generally easy to categorise. All animals are heterotrophic, as are fungi. 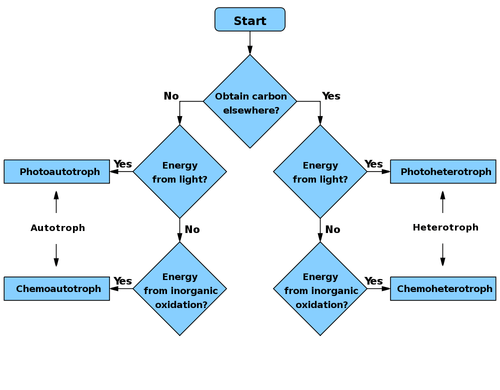 Plants are generally photoautotrophic. Some eukaryotic microorganisms, however, are not limited to just one nutritional mode. For example, some algae live photoautotrophically in the light, but shift to chemoorganotrophy in the dark. Even higher plants retained their ability to respire heterotrophically on the starch at night which had been synthesised phototrophically during the day. Prokaryotes show a great diversity of nutritional categories. For example, purple sulfur bacteria and cyanobacteria are generally photoautotrophic whereas purple non-sulfur bacteria are photoorganotrophic. Some bacteria are limited to only one nutritional group, whereas others are facultative and switch from one mode to the other, depending on the nutrient sources available. ↑ Kenneth Todar (2009). "Todar's Online Textbook of Bacteriology". Nutrition and Growth of Bacteria. Retrieved 2014-04-19. ↑ Kelly, DP; Julie Mason; Ann Wood. Energy Metabolism in Chemolithotrophs. Springer. pp. 186–187. ↑ Andrews, J. H. 1991. Comparative Ecology of Microorganisms and Macroorganisms. Springer Verlag, Berlin, p. 68, . ↑ Y. Kellermann, Gunter Wegener, Marcus Elvert, Marcos Yukio Yoshinaga, Yu-Shih Lin, Thomas Holler, Xavier Prieto Mollar, Katrin Knittel, and Kai-Uwe Hinrichs. Autotrophy as a predominant mode of carbon fixation in anaerobic methane-oxidizing microbial communities. PNAS 2012, vol. 109 no. 47. ↑ Alexander Eiler Evidence for the Ubiquity of Mixotrophic Bacteria in the Upper Ocean: Implications and consequences Appl Environ Microbiol. 2006 December; 72(12): 7431–7437; doi:10.1128/AEM.01559-06.